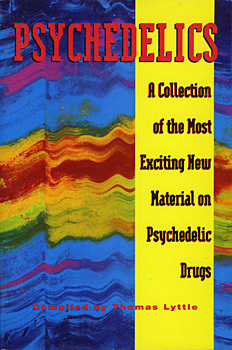 Psychedelics is a broad and serious inquiry into the natureof psychedelic drug use. It provides powerful examples of why people use these substances and why they stay true to the subject. Why are these substances so popular among the young? Can they really be used in therapy? Why are they revered as sacraments in other cultures? Who are the people who use them? Why is Madison Avenue so enthralled with the psychedelics sub-culture of the 1990's? The 1990's has seen a resurgence of interest in psychedelic drugs and culture, and a new wave of experts and pundits has emerged within the field. Psychedelics offers original, contemporary articles written by those who are at the forefront of this movement. If you have an interest in psychedelic drugs and culture, and are wondering what is going on today, Psychedelics will serve as an excellent introduction. Thomas Lyttle is publisher of Psychedelic Monographs and Essays, an academic-sytel journal dealing with psychedelic substances and related SOC (States of Consciousness) studies. He is the author of more than 50 articles and seven books for the popular and scientific press.